The Konnected device can accept 6V to 24V DC in the base, or 5V DC via USB cable directly to the logic board. 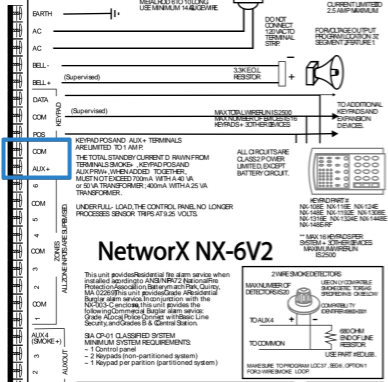 If you’re replacing an existing alarm panel system, you can probably draw 12V DC from the existing system. Many alarm systems also have back-up batteries that you can take advantage of in this case. Disconnect the Power to the alarm panel before you begin. Usually this means unplugging a power adapter and unplugging the backup battery. Find the AUX Power Output on your existing alarm panel. It should be two screw terminals labeled with AUX+ or + and COM, - or G. There are probably already a number of wires attached to these terminals for your various powered sensors and keypad. Loosen the screw terminals with a screwdriver, being careful not to let any existing wires slip out. DO NOT CONNECT THE KONNECTED DEVICE TO AC POWER. Do not confuse the AUX Power Out on the alarm panel with where the alarm panel receives AC power. Connecting the device to AC power will damage the device and may result in electrocution or fire! Verify that the AUX Power Output is between 6V and 24V DC. 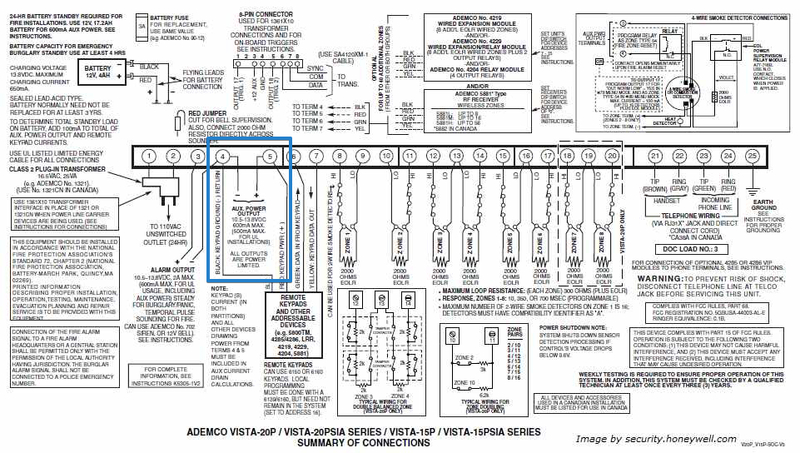 Usually the voltage is labeled on the wiring diagram or user’s manual. If not, verify with a multimeter. Using the DC Power Pigtail insert the red bare wire into the AUX + (or +) and tighten. Insert the black bare wire into the COM (or - or G) and tighten. Insert the round end in the Konnected Board. You will see the Blue light on the WiFi board blink a few times and turn off when it powers up. You will not see any lights on the Konnected board. A power adapter should have been included in your kit. If you have acess to an 120V AC outlet just plug it into the outlet and your board. If you only need to power the Konnected device, you can use most any USB power adapter and a Micro USB cable. Phone chargers work great. Note that when powering by USB, you cannot draw power for external devices like motion sensors or a siren. You can power multiple Konnected boards with one power source using a splitter. If you ordered kit larger then 6 Zones one should have been included in your kit. You can also order one at our store.